Sunset at the mysterious Bilavas Devil's Boat. Paradoxally often we can learn more about the lives of ancient people from their last resting places and not from their places of residence. Ancient burials are valuable archaeological monuments due to this and such locations are registered and studied. Medieval cemeteries have cultural historical value as well and are considered to be landmarks as well. Burials in general are grouped in smaller or larger groups - such prehistoric groups of burials are named - grave fields, groups of later burials - cemeteries. But there are cases when there are found separate graves which do not belong to larger group. Funeral rites differed in different time periods and in different cultures. Many ancient cultures had a habit to give different things to deceased for their journey to afteworld - household objects, weapons and luxury items. Such objects are valuable finds which let to find out the affiliation of the deceased to certain time periods and cultures and numerous other things. The appearance of grave is informative as well - the site of the burial can be plain or with mound, there can be different settings of stones on the grave. Human remains are very important too - contemporary science can extract numerous interesting facts from the remains of teeth and bones of the deceased ones. 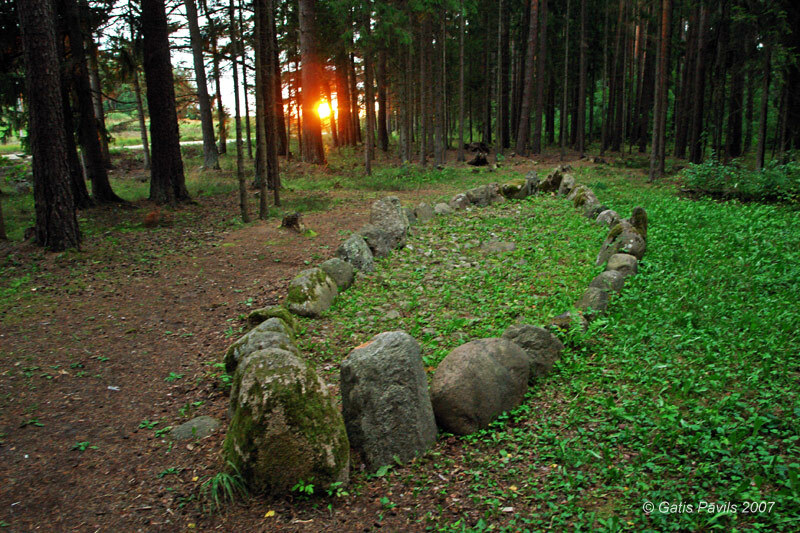 For general tourists this category of landmarks is much less interesting - nearly all ancient burials in Latvia are visually uninteresting. There are few exceptions though - for example recently reconstructed Bilavas Devil's Boat in Talsi district, Lube municipality. But we should bear in mind that these landmarks are exceptionally valuable from the standpoint of science and searches of our identity. Below are listed all the ancient burials described in this website. Each column in this table is sortable by alphabet - just click on the header of the table. The first column - "No." - gives an order of appearance of the landmark in this Website.